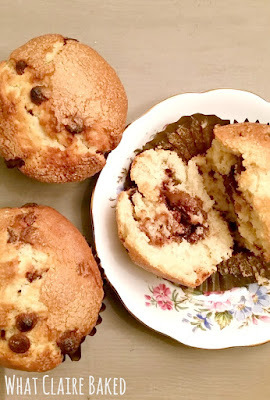 Readers, I found myself back in the kitchen tonight after a request from Mr WhatClaireBaked for some chocolate muffins. Muffins are SO EASY to make at home but it’s something I save for special treats as they aren’t the healthiest. Tonight’s challenge was to take muffins to the next level… mission complete. These bad boys are Nutella stuffed. I possibly slightly over estimated on the amount of mix, but can guarantee this recipe will produce at least 10 generous muffins. They are best eaten slightly warm or, if it’s the day after, go for 15 seconds in the microwave before you eat them. Perfect with a fresh coffee in the afternoon. Add the sugar and eggs to a bowl and using a hand whisk, bring the two together. Add the vanilla extract, milk and sunflower oil. Mix to combine. Add in the flour and baking powder (don’t worry about sifting – mix should be lumpy). 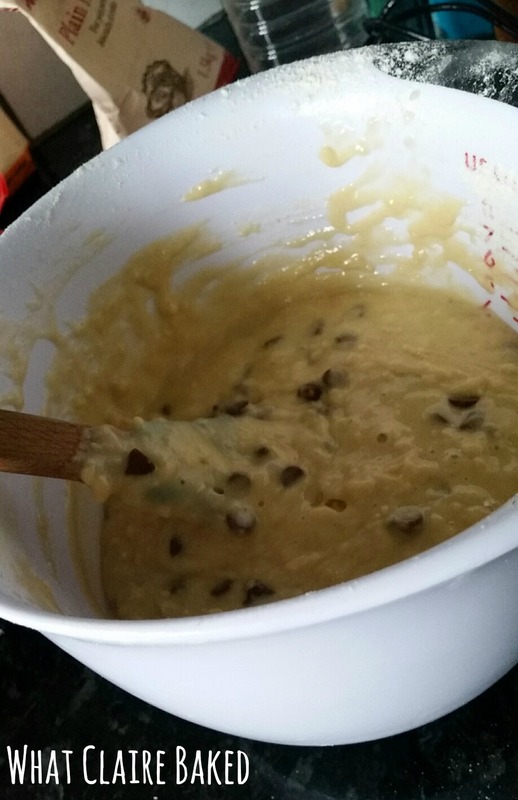 Mix to JUST combine, then stir in the chocolate chips. Thick and lumpy batter is ideal! 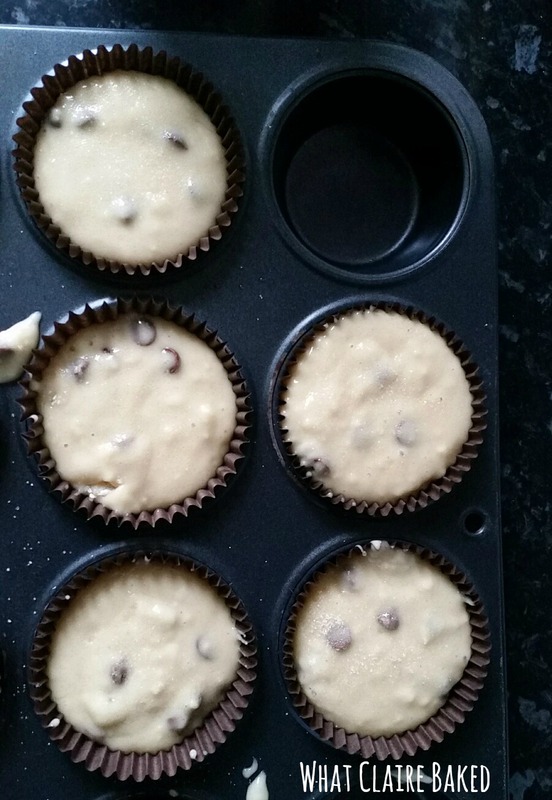 Add muffin cases to a muffin tin. Add mix to about halfway up each case. Then, dollop a half teaspoon of Nutella on to op of each mix. Following this, add a little more batter to encase the Nutella. This should take you to around ¾ full in each case. 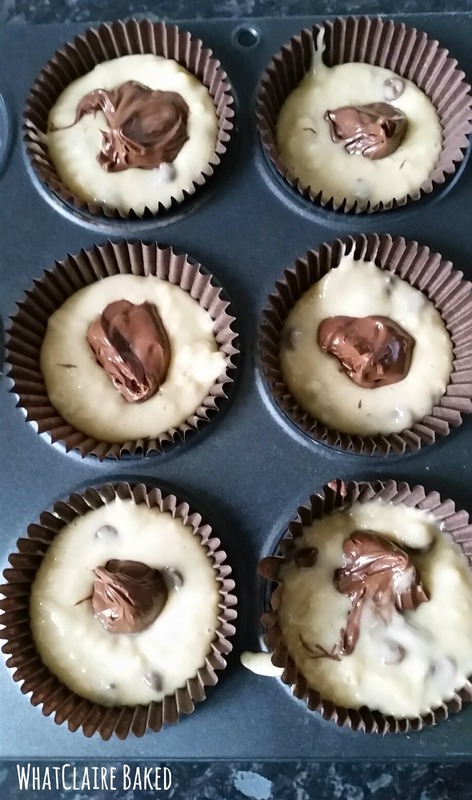 Transfer to the pre-heated oven and bake for around 20 minutes or until a skewer inserted to the batter leaves each muffin with a few crumbs. Allow to cool slightly before serving with coffee. Store any leftovers in an airtight container for 2-3 days.